I don’t see the Cooly interview audio on the Kobren page in your link. That page says see full interview below, and it’s not there. And where it looks like you should click to hear the first part, I clicked it, and nothing happens. 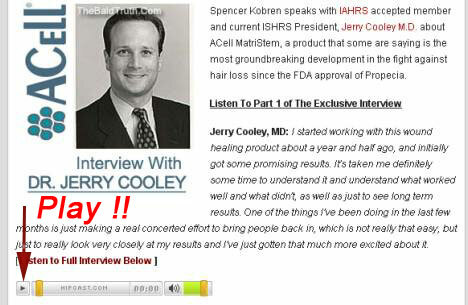 » I don’t see the Cooly interview audio on the Kobren page in your link. » That page says see full interview below, and it’s not there. » it, and nothing happens. Can’t you see the player like in the screen shot below ? » » I don’t see the Cooly interview audio on the Kobren page in your link. » » That page says see full interview below, and it’s not there. » » it, and nothing happens. » Can’t you see the player like in the screen shot below ? Could be a pretty big deal. I don’t want to get over excited, but this could trump Aderans at least in the short run, because being able to transplant plucked hair (which then cycles) does open the door to basically unlimited donor supply. And he’s already done this and doing this today, it sounds like they just need to see if the hairs are DHT resistant (I don’t see why they wouldn’t be) and cycle normally over time. Wouldn’t this be a boom to the HT industry in the short run at least? If people can get transplants without having to worry about donor supply, it’s going to become a much more popular procedure. They perform strip procedures today well knowing that if you put more effort in FUE new methods can be easily achievable like donor regrow etc. » effort in FUE new methods can be easily achievable like donor regrow etc. Well that depends on what you want. If you don’t want strip and are willing to pay, you can always do FUE. I mean no one’s putting a gun to anyone’s head making them do a procedure they don’t know anything about. This is definitely an example of someone doing something new and what sounds to be fairly ground breaking work with FUE. The only thing is from some of those other links posted, it sounds like the plucked hairs only grow 1 hair per graft (is that right? ), as opposed to a regular transplanted folicle that would grow several hairs. Oh well. It would still be a lot better than nothing. I was totally skeptical of this until I heard this. Thanks for the post Iron Man. IMHO we have a HUGE breakthrough here. In a few more months I bet we’ll see some results from Cooley and then we can gauge how effective it is and if it is truly effective we should all go out and party because this is an GREAT step in the right direction. » this is an GREAT step in the right direction. » The glass is half full. I’d say it’s more than half-full if those hairs can cycle normally. The other good thing about this is it’s all something that can be done today, it doesn’t need to be subjected to years of trials via the FDA, it’s just using existing procedures (FUE + Acell). Writen by Dr. Jerry Cooley on his own website - no mention of anything else,just strip procedure - WHY? » else,just strip procedure - WHY? He’s been testing the procedure for the last year or so, it’s not something he advertises as a finished product. From the sounds of it, if you really want to try it out though he’s already done the procedure to a few patients as a test. There’s one guy on another board that just had it (will need to wait a few months to see results) and Cooley mentioned a woman he did 1500 grafts on using plucked hairs. -he says he is going to document it with macro photographs, and biopsies of the new follicles. For the sceptics (like me). Apparently Hitzig was not able to make credible photographs (imo, this is quite unbelievable) so Cooley decided to give it a try. -he is now begining to make “pluck tests” on the transplanted follicles to see if they can cycle. He doesn’t know yet if they cycle. -he says he is progressively increasing the number of transplanted hairs (plucked): 100, 200, 400, 1500 plucked hairs. -he seems open to the idea of full restaurations. All in all, Cooley seems pretty reasonable and credible. Most probably, the hairs won’t cycle, (this is my guess), but Cooley seems to be determined to test this, and to document everything, so I have no objection in giving him some time to do these tests. I just don’t understand why Hitzig and Acell have behaved like pathological liars all this time. No doubt about it, you may only get single hairs but if (and it’s a very big IF) this works consistently and cycles normally as DHT resistant hair follicles then I think it would be the greatest advance in hair restoration ever. » Cooley decided to give it a try. » see if they can cycle. He doesn’t know yet if they cycle. » (plucked): 100, 200, 400, 1500 plucked hairs. » -he seems open to the idea of full restaurations. » All in all, Cooley seems pretty reasonable and credible. » objection in giving him some time to do these tests. » pathological liars all this time. Acell is just a company, they’re not specialized or set up to be able to apply something like Acell and figure out how to use it for the purposes of hair regrowth because it’s not as simple as just putting powder on a bald scalp and getting to grow. They need a person like Cooly to move in and really figure out how to best use the product. » scalp and getting to grow. Badylak and Spievack lied about the finger story. Acell rep lied about Dr. Jones experiment. This is what I am referring to. Oh, btw, in the interview, Cooley also says that he has not been able to grow hair in a site where there was no hair , by simple application of the powder (a la Jones). He says he can do it only by transplanting a plucked hair. what is the problem with single hairs? I think its even better. -Will Cooley provide convincent proof? Lets remember that Cooley worked for ICX and they fooled us for around 5 years!! And Hitzig and Acell are not reliable either. -is it necessary to use beard hairs as source? what happens if these beard hairs are very strong? will the plucked beard hair also grow strong in the recipient site? Well, Cooley said that he tested 1500 plucked hairs on a woman, so these are sure no beard hairs. » » this is an GREAT step in the right direction. » » The glass is half full. » I’d say it’s more than half-full if those hairs can cycle normally. » just using existing procedures (FUE + Acell). Yes, the very good news is that any doctor can try this on their patients so it is not going to be monopolized by 1 or 2 companies, I am more excited about this than Aderans.